Based on its concept, Into_Now is what social TV should be—a fun, innovative way to share what you’re watching with others. But one thing is missing: enough people participating in the conversation. Into_Now doesn’t replace a TV listing app—you need to be watching something for it to work. It can help you find popular shows and lets you search for shows that have already aired; you can filter by the last 24 hours, week, month or all-time, but for show discovery you’re better off with an app like TV Guide Mobile. 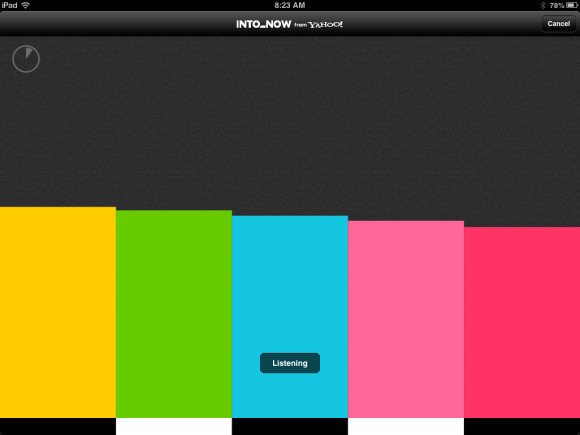 Into_Now’s killer feature is that it listens to what’s on the TV and identifies the show based on the audio. You don’t need to search for the show or do anything besides watch. To my amazement, it correctly identified my shows every time, whether they were live or recorded on my DVR. 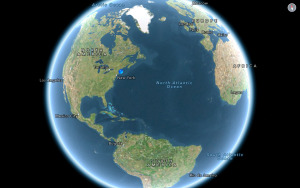 The app is designed for iPhone and iPad models running iOS 4.3 or later. Once it finds the show you have on, you can chat with others who are watching, or simply comment on posts from those who watched before. If you have friends using the app, you can connect with them through the app and create your own private chat about a show. The app’s CapIt feature lets you make a visual point about a show: CapIt grabs a screenshot and lets you add some text over it. It’s an instant meme-maker. You can choose from several screen grabs that show the action just before you click the CapIt button. While Yahoo has built a great platform for social TV, Into_Now has yet to build a robust community that would make its features useful. For now, it feels like you’re talking to yourself when you post a comment about a show. Many comments are months old, and most have no replies. If you can get a group of friends to participate, Into_Now has the potential to be the most fun social TV platform. But until the crowds come, you’ll mostly be entertaining yourself.